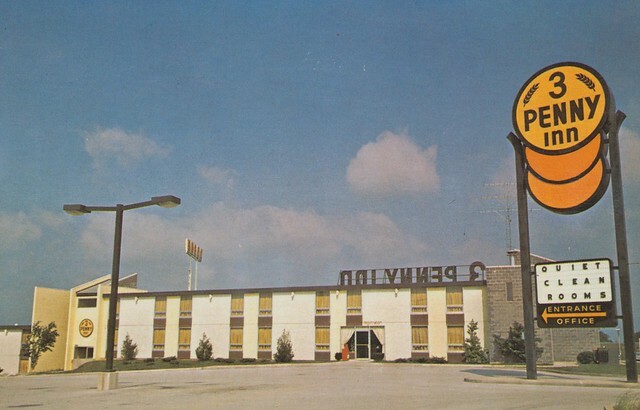 The economy rate motel was built by the Allen Construction Co. of Bowling Green. 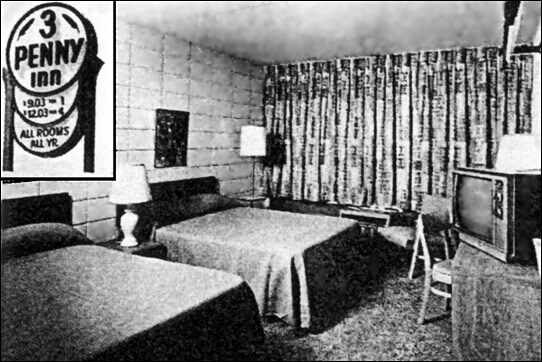 It was the second pilot project in the country (the first a converted motel in New Paltz, New York). There were 80 units on side and it was built of ultra-fire resistant masonry and concrete. Only four 3 Penny Inns were opened and all were operated by the Company. The first was in New Paltz, New York and was a conversion of an existing motel. Of the three that were purpose built only the Bowling Green property remained extant into the 2010s. There were only four 3 Penny Inns opened. Unfortunately for its forward looking creators, the Arab Oil embargo and subsequent “energy crisis” coincided with the concept’s introduction and Company support for the project was withdrawn. Information on how long these locations lasted is difficult to find. I am certain none of them saw much of the 1980s as the trademark was cancelled in April, 1981. Only the Bowling Green location was featured on a postcard. I have seen a matchbook advertising all four locations but little else remains. The 3 Penny Inn was a decent idea but came along at the wrong time.